The exhibition on William Kent at the V & A (22 March-13 July 2014) was accompanied by a catalogue examining all aspects of Kent’s designs, including his frames. ‘not only consulted for furniture, as frames of pictures, glasses, tables, chairs etc., but for plate, for a barge, for a cradle’ (p. 469). But frames, for Kent, were never just one more item in a list of furnishings. He was perhaps the first indigenous British architect and designer to realize the importance of the picture frame within an interior: that it could be to a large extent the unit of articulation for the decoration of internal walls, the emphatic accent for focal points such as the chimneypiece, and the stylistic glue which bound the painting to the architectural interior and to the furnishings and other objects in the room. 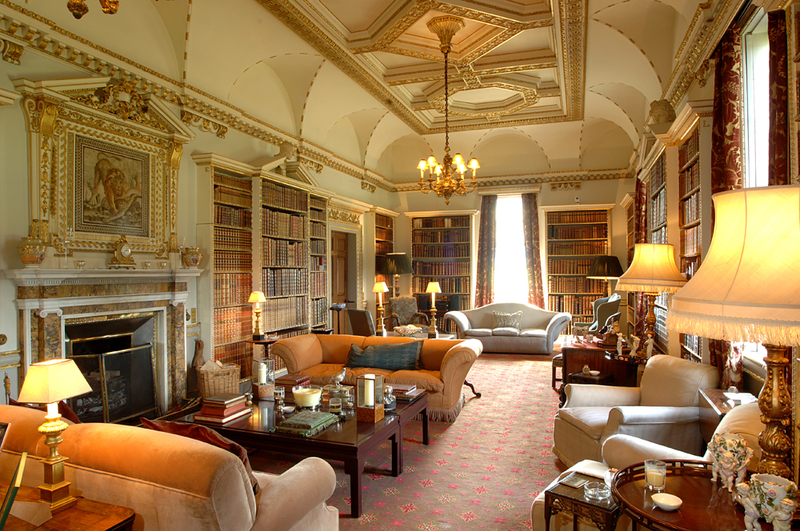 Kent’s frames are an extension of other architectural features within a room: they match the structure of the doorcases, the chimneypieces and the windows, whilst their decoration echoes elements and motifs from the furniture, looking-glasses, brackets, silverware, metalware, and other objects. His more ornamental frame is an attention-grabbing focusing device, frequently forming part of an architectural centrepiece, and drawing the eye of the spectator irresistibly towards the painting it contains. ‘A polymath, he turned his hand from painting to designing sculpture, architecture, interior decoration, furniture, metalwork, book illustration, theatrical design, costume and landscape gardens’. This is a breadth of achievement and interest to analyze, order, and discuss in discrete chapters; and it takes a total of twenty-one of them (plus the introduction and a chronology), covering such diverse themes as ‘The Royal court, political culture, and the art of friendship’, ‘Kent and Italy’, ‘Kent and the Gothic revival’, ‘Public commissions’, ‘Sources for Kent’s furniture designs’, etc. Practically every one of these chapters has a frame, or several, in it; they march in grids of wood and stucco across ceilings, hold looking-glasses, perch on chimneypieces, define engravings, border cheval screens, and contain memorial sculptures. If you want to know about Kent’s designs for picture frames, Chapter 9 is nothing but the abridgement of a summary: you will have to read many of the 700 other pages. Chapter 5, ‘Kent the Painter’, would perhaps be one choice if you wanted illustrations rather than text, since the ceilings with (from about 1725) their stucco and painted borders, the staircase paintings with their fictive picture frames, and the architectural designs, take us from the 1720s to c.1747-51 in a geographical sweep of British houses, and an overview of Kent’s development from pure painter to decorative artist. Brindle also gives a description of Kent’s technical methods, including the transfer of architectural detail – such as lengths of egg-&-dart ‘mouldings’ – by the use of pricked pouncing-papers, some of which (used for the Queen’s Staircase at Hampton Court), are illustrated. He examines Kent’s restricted palette in certain schemes, such as the monochrome paintings in fictive frames on a base of olive-green, with gilded detail (see The Great Staircase at Houghton Hall, above). In some cases, Kent seems to have worked out every element of these schemes, executed the main pictorial scenes, and left the decorative work to his unknown assistants. Kent capitalized on his birth (to a joiner) and his apprenticeship (to a coach- and house- painter) in his understanding of the processes by which his invention came to birth. After that, his uncanny ability to attract influential sponsors and patrons gave him the education, experiences and contacts which nurtured his wide-ranging talents. The year he is first recorded as a painter, working in London (‘William Cant of the City of London, limner’, 1709, p.13), is the same year that he is off to Italy, aged 24, with the antiquary John Talman. There he encounters Thomas Coke of Holkham and Richard Boyle, Lord Burlington, with whom he travels back to England, a decade after he left it. In Italy he visits many of the main towns and artistic centres, including, notably, Palladio’s Vicenza. By 1720 he is working with Henry Flitcroft, Burlington’s ex-carpenter, draughtsman and architectural assistant, on The Designs of Inigo Jones . . . with some additional designs (1727). 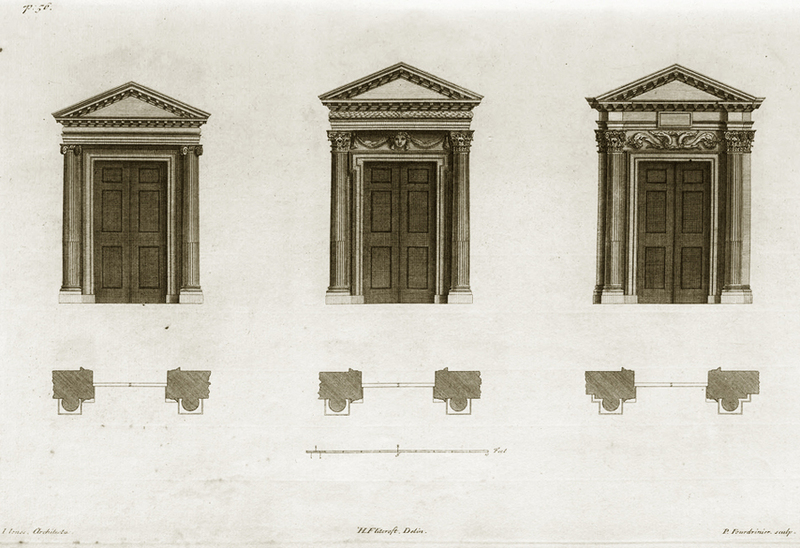 Burlington had purchased a collection of drawings by Inigo Jones and John Webb from John Talman, and the coincidence of a close study of these with Kent’s experience of Palladio’s work in Vicenza and its environs, and with the Baroque interiors of Roman palaces and churches, was the seed-ground for the Palladian (‘Kentian’ or ‘Kent’) style in Britain. 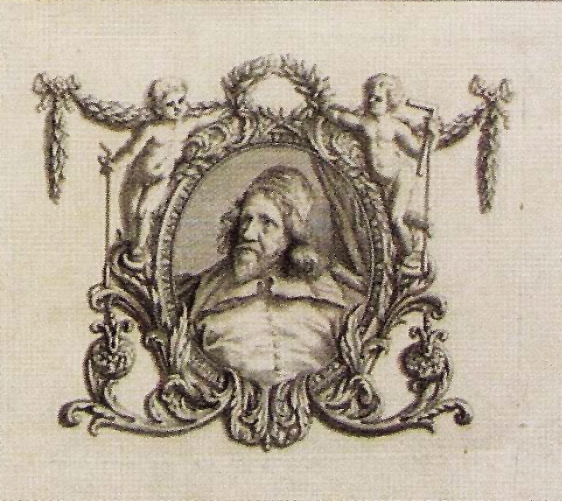 The Designs of Inigo Jones…, Publish’d by William Kent, vol. I, 1727, page 56. 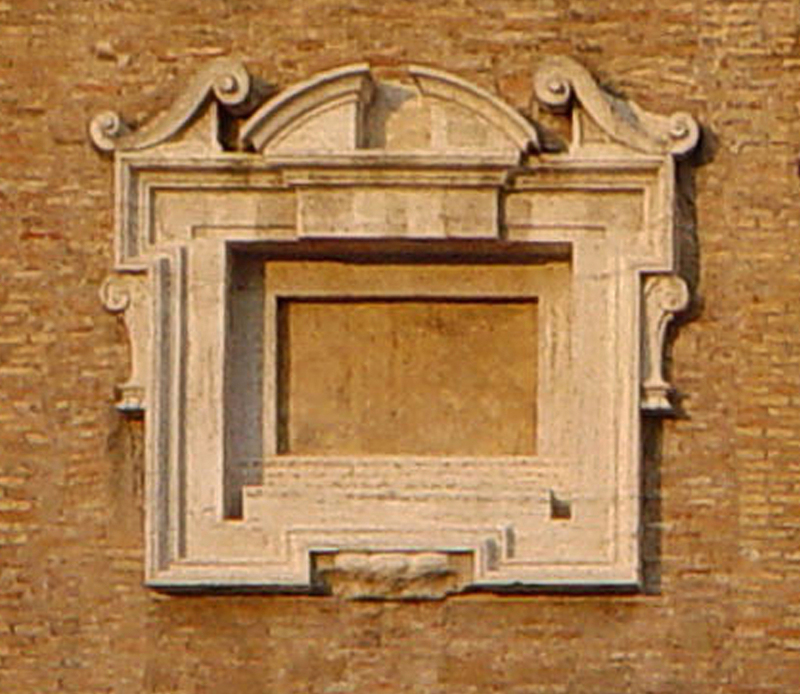 They have a very simple structure, being fundamentally an anglicization of the cassetta frame, with an architrave profile enriched by classical architectural mouldings, such as egg-&-dart, below the top edge and at the sight (contemporary carvers and gilders often referred to them as ‘architrave frames’). 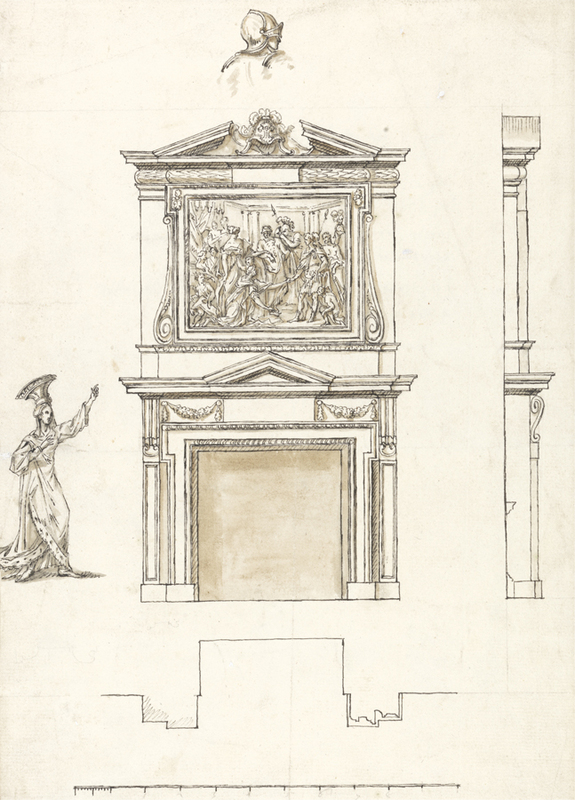 A page of doorcases in The Designs of Inigo Jones … (page 56) reveals one of their sources, in the outset corners of the centre model; whilst a drawing for a chimneypiece in Somerset House by Jones shows this structure even more clearly. These contours and their ornaments – the outset corners, enlarged modillions or brackets, the open or broken pediments, and the form of those pediments, with segmental or triangular shapes offset against each other, and voluted swan’s neck forms – were derived ultimately from the Mannerist games played by Michelangelo with classical architecture (see ‘National Gallery reframings: an update’). The outset corners and geometric ornaments of Mannerist architecture were also to be found in the Spanish ‘Herrera’ style of the 17th century, and by diffusion – via the Spanish presence in Naples and the Netherlands – also in Neapolitan and Northern picture frames. This eclectic genesis gave Jones’s designs their innovative twist, and was highly influential for Kent’s own approach. Kent’s frames were, however, more structurally than ornamentally similar to Jones’s. The ‘Kent’ frame in its bare essentials as described above – an architrave profile with one or two architectural mouldings – was only the embryonic form. The flat frieze, often merely sanded and gilded, could be covered with bands of carved decoration – enriched flower-chains, Greek fret, Vitruvian scrolls – whilst the top and sight edges became the playground for all kind of leaf and husk moulding. The contour could be elaborated with outset corners at top and bottom, just at the top, or outset on just one rail. The corners of the frieze could be carved with classical paterae, acanthus (‘raffle’) leaves, or rosettes of Baroquely-swirling foliage. 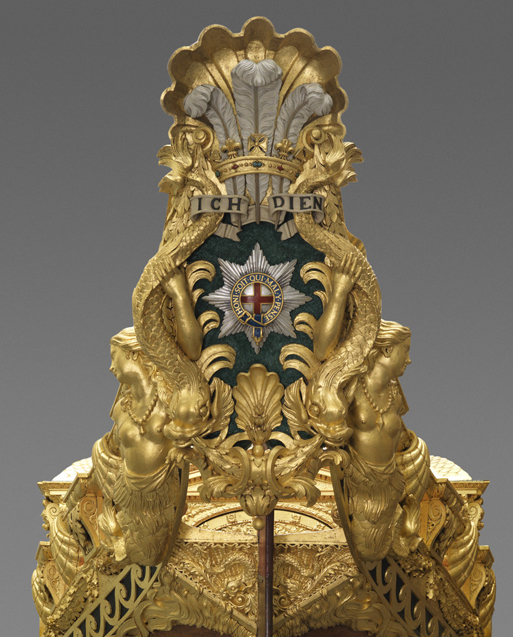 The crest could be crowned with pediments of various kinds, often holding shells, masks or têtes espagnolettes, and these could be echoed by the decoration of an apron at the base, making it a true tabernacle frame. Swags of fruit, flowers, oak and other leaves might be looped and skeined across the top of the frame, and let fall in pendants down the sides. 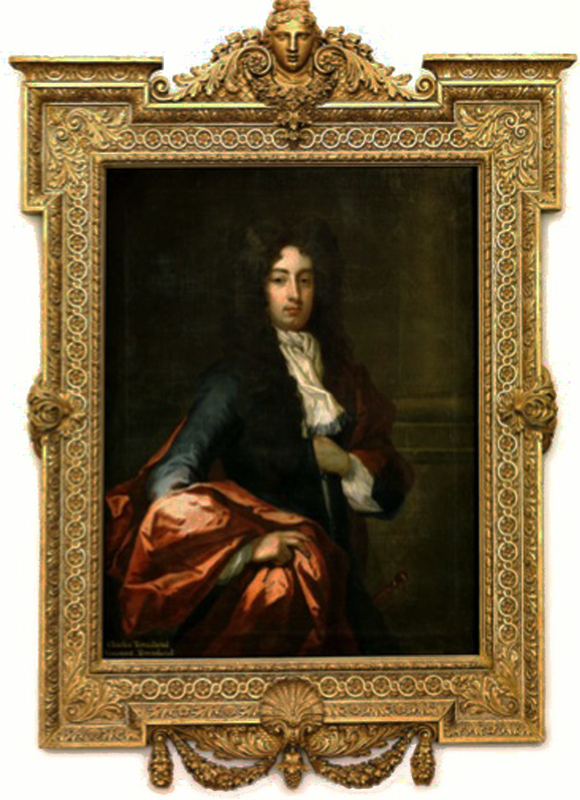 Around 1730 Kent designed a frame for Viscount Townshend of Raynham Hall, and four versions of this were made by James Richards, Master Carver to the King, for a set of family portraits (Sir John Ashe, Lady Ashe, Charles, 2nd Viscount Townshend, and his younger brother, Horatio Townshend; information courtesy of Lord Townshend). The portrait by Kneller of the 2nd Viscount was a striking highlight of the exhibition at the V & A; it epitomizes the decorative sophistication of the best of Kent’s designs for frames, their sheer opulence, and the technical skill of the carving. Although the profile is almost the simplest of any type of frame, because the whole surface area is covered in ornament it gives an impression of great richness – but a richness held in check by the strictly linear form of the rails. The contours are softened by the foliate clasps at the sides; the apron, with its shell, raffle leaves, swags and drops; and the crest with foliate S-scrolls above an infill of imbricated scales, husks, raffles leaves, garland, and a female mask. 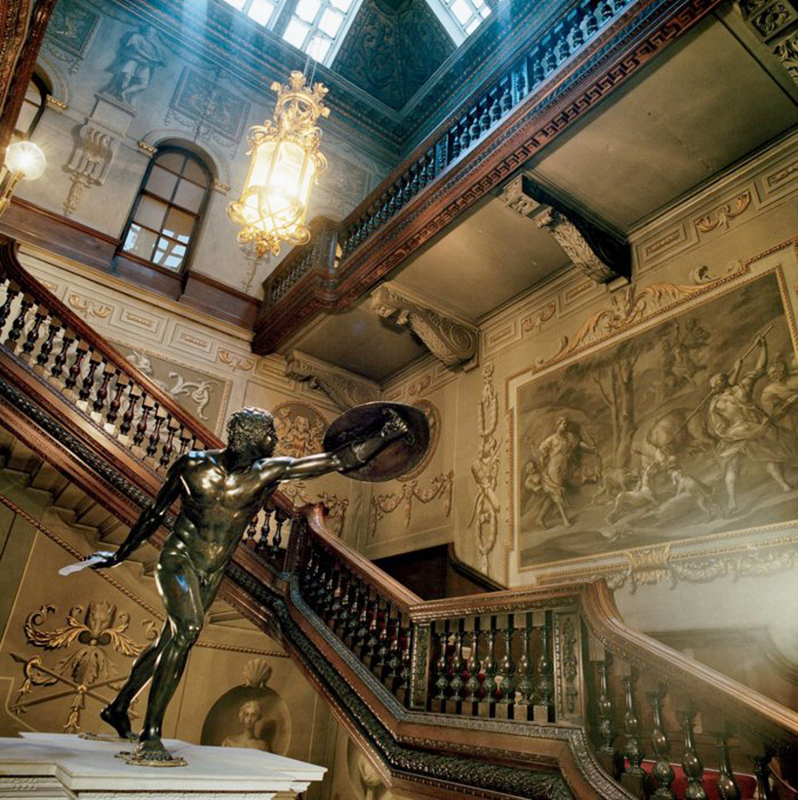 Hung within the monochrome purity of the entrance hall of Raynham Hall, two of the portraits glow like cameos in their rich filigree settings. ‘His country house commissions evolved informally, from providing decorative paintings to arranging collections to remodeling and extending older houses. In this way Kent contributed to country house design as an artistic adviser, not as a contracted supervising architect responsible for project management. 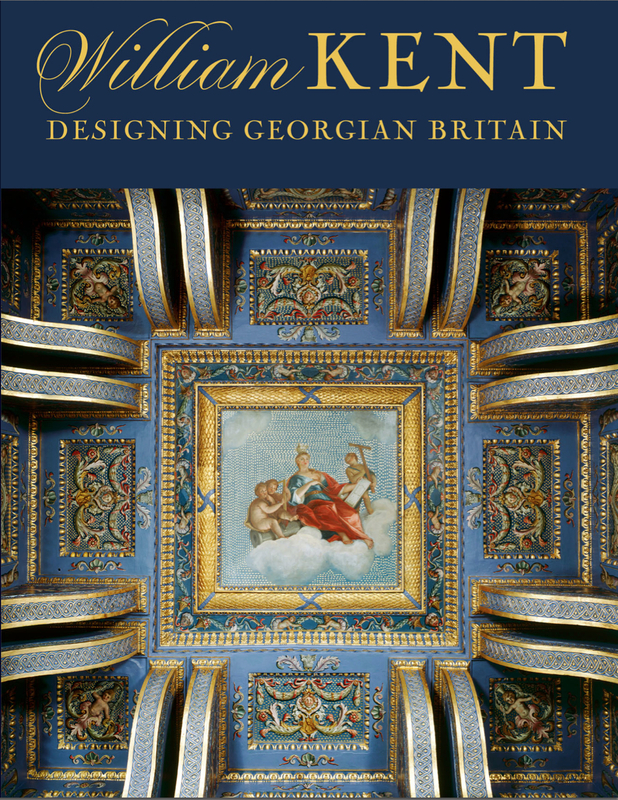 In modern parlance, Kent was more a decorator than builder, but such terms risk underestimating the depth of his involvement in redesigning the British country house.’ (p.184). Bryant also reminds us that Norwich in the 18th century ‘was still Britain’s second city’: Kent’s country houses orbit around the twin suns of Oxford and Norwich. The arrangement of the room is striking: the elaborate integral wall frames holding Kent’s paintings of Venus & Aeneas on either side of the main door, and supporting in a softened form the grandeur of the doorcase; the focal point of the chimneypiece and overmantel painting; the smaller doorcase; the sculpted busts, figures, and framed plaster reliefs; and the white benches set against the walls. This complex ornamental scheme pivots on the fulcrum of the frame – door frames, wall frames, overmantel frame: the internal architecture marries the functional openings of door, window and chimney to the imaginative openings of the paintings into a classical and allegorical world. Another early commission was Wanstead House in Essex, first designed by Colen Campbell, and demolished a hundred years later. 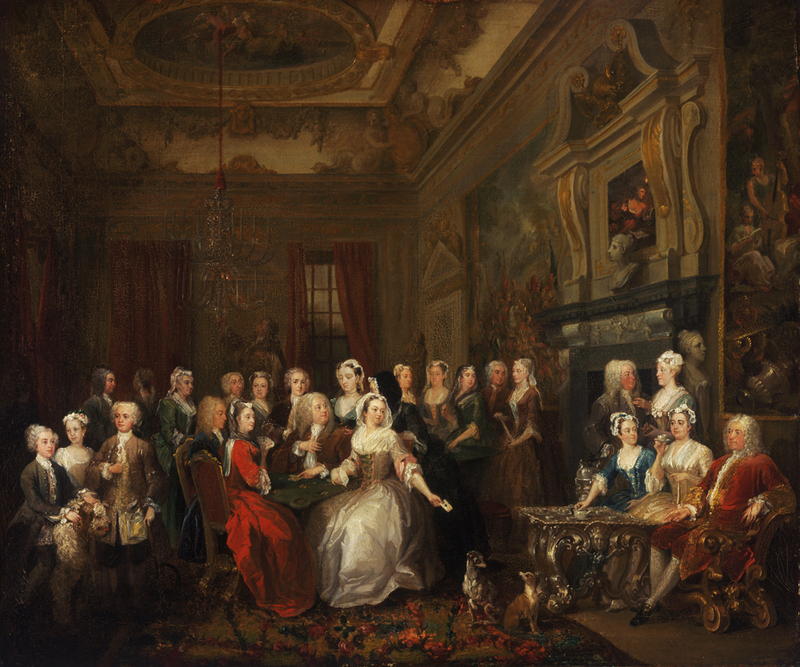 Hogarth’s painting of a Kentian interior there, although exaggerating the furniture and chimneypiece with satirical intent, does give some idea of the richness of Kent’s programmes for his decorative schemes, and of the magnificence of such a setting for a social occasion, in the spirit of those Roman palazzi. It also shows how such an interior functioned, as an extremely rich shell containing comparatively few free-standing items, which would be ‘furnished’ by the gathering within it. 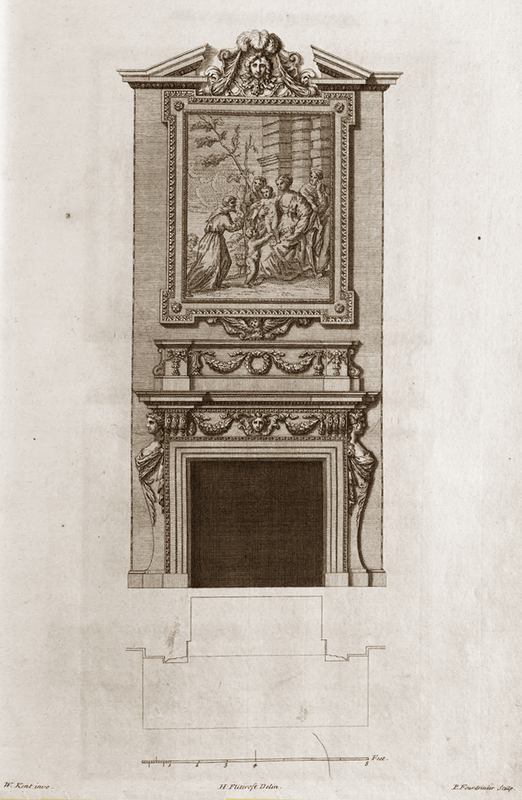 William Kent, Design for the north wall of the saloon, Houghton Hall, 1725. Private collection. An even more carefully-arranged hang would characterize part of Kent’s vision for Houghton Hall, Norfolk (c.1725-35). 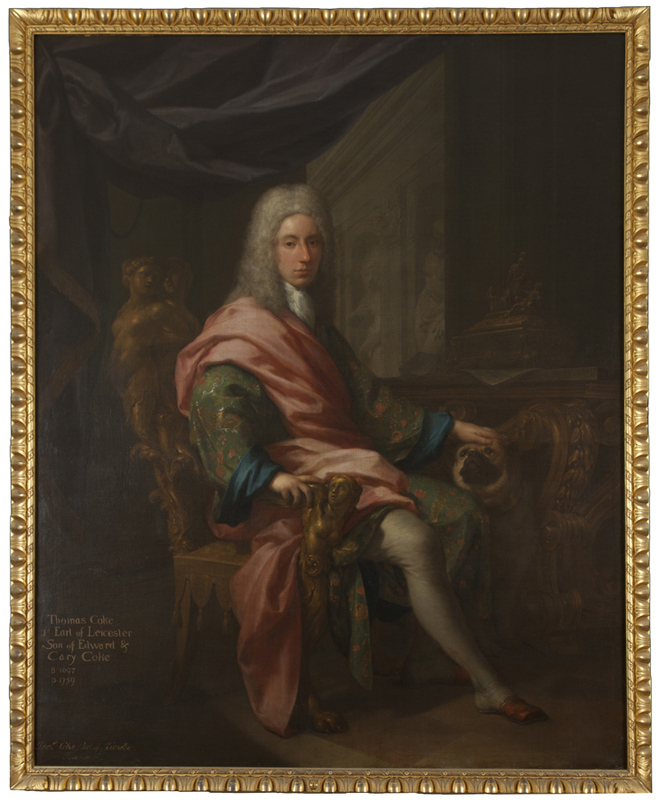 This was not the reimagined Roman holiday of a young aristocrat, but the social and political setting for a middle-aged politician (Sir Robert Walpole) who – rather than inheriting – was in the process of acquiring his own major art collection. Kent’s designs for two walls of the saloon epitomize the view he had arrived at by the later 1720s, of the interior as the inner shell of a room. 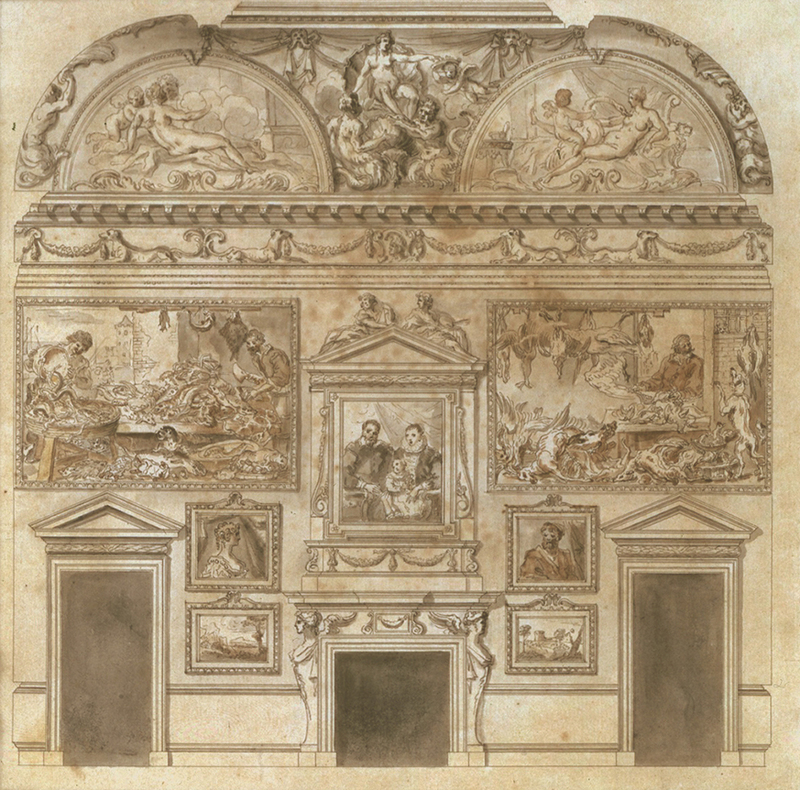 This shell would include the programme of paintings on the ceiling and its cove; the interior architecture of cornice, frieze, door- and window-cases, chimneypiece and overmantel; the arrangement of paintings on the walls, with their frames and echoing ornaments; and the furniture which stood against the walls, such as console tables. The overmantel and doorcases on the north wall (above) form a compositional triangle, highlighted by their more important features (such as pediments), and by their ornament; this is filled in by paintings in secondary frames, and then expanded upwards to the largest works, in simple egg-&-dart mouldings, and onwards to the ceiling cornice. The decorations and motifs throughout echo and reinforce each other, and the frames are bound together by their principal mouldings, and their increasing enrichment. Kent’s drawings for both north and south walls of the saloon are unexpectedly small in the flesh, but they convey in miniature a wealth of decorative and cohesive meaning. 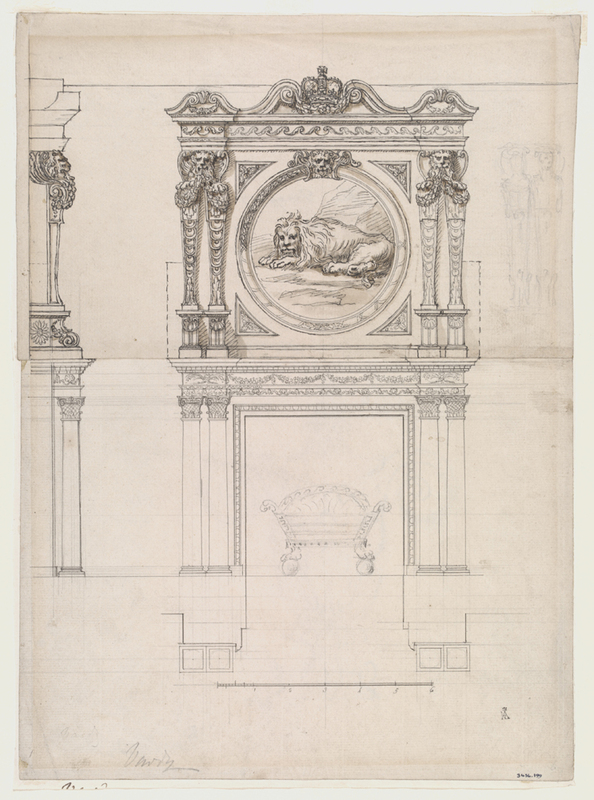 This is made explicit in Kent’s drawing for the chimneypiece of the north hall at Stowe, where the two tiers of the fireplace and overmantel mirror each other, even to the triangular pediment. It was designed to hold Christophe Veyrier’s The Family of Darius before Alexander, a bas-relief, and this subject of military might and mercy is emphasized by the ornament – a helmet at the crest, a torus of bay leaves in the entablature, and swags of oak leaves on the frieze of the fireplace. 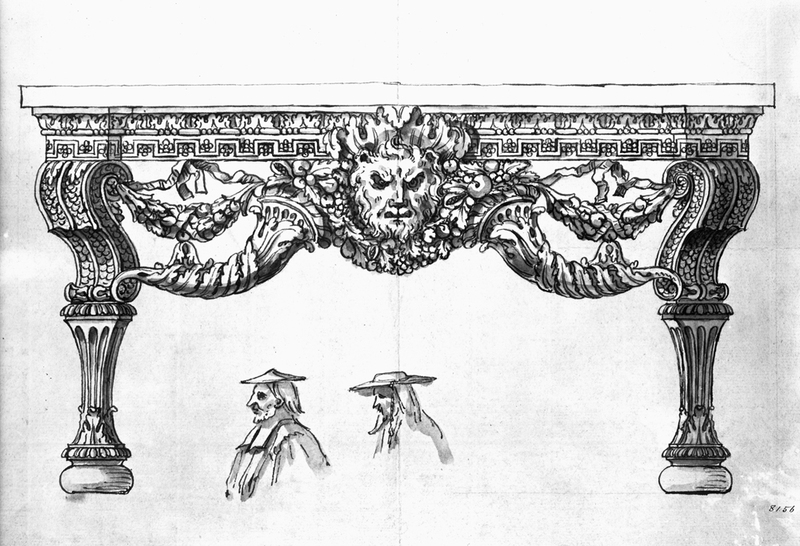 The frame of the bas-relief is supported by Mannerist scrolls; the whole structure has moved on appreciably from Inigo Jones’s chimneypiece for Somerset House. In some ways the great surviving Kentian house is Holkham Hall (c.1729-64), although Bryant points out that it was the work, not only of Kent, but of Colen Campbell, Coke himself, Lord Burlington, and Matthew Brettingham (who attempted to steal much of Kent’s credit for himself). Here, the library reveals how architectural furnishings (such as integral framed panels, chimneypieces and bookcases) could organize the composition of an interior in the same way that wings, varying roof levels, bays and set-back walls, windows and areas of rustication, could organize the exterior. and that Thomas Coke and John Vardy may be responsible; but if so, then the guiding spirit is still unarguably that of Kent. At Rousham House, the work is all Kent’s own, and there we see something even Walpole would not have disdained as heavy: an adventurous jeu d’esprit of an overmantel frame from which all the cumbrous weight of pilasters and modillions has been trimmed away, leaving a single decorative moulding between the swan’s neck pediment and female mask at the top, and the pedestal with Vitruvian scroll at the bottom. The sides are supported by cavorting dolphins, and the whole is playful and decorative to a degree. Kent painted this interior white, which would have added to the light and festival air of the whole. Attributed to William Kent, looking-glass, probably for the White House, Kew, 1733–34. Carving attributed to John Boson, with later additions to the base. Victoria & Albert Museum, London, W.86-1911. As well as commissions from private citizens, Kent was also employed by the King and by his son, Frederick, Prince of Wales (Chapter 11: Royal Commissions; Steven Brindle). Kent designed the Royal Barge for the prince, and also a home for his court – the White House at Kew (demolished in 1802) – from which various pieces of furniture survive, including a looking-glass frame (above). 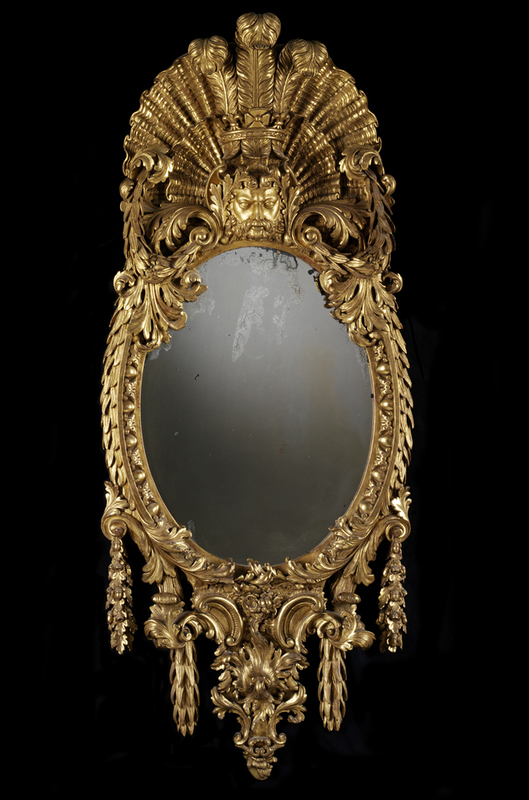 The art of the looking-glass frame is appreciably different from that of a picture frame: if rectangular it is narrower and more upright in structure, but can frequently be oval or round; it can be even richer than a picture frame; it functions as an ornamental unit of an interior scheme when it is not being used functionally, as it were; and the whole vocabulary and decorative emphasis is therefore cast in a higher key. This particular example displays an example of imaginative elaboration on the tête espagnolette (a carved female head with a crown of feathers). The mask is male – possibly a green man, as he is bearded, and the whole confection is created mainly from palm leaves and acanthus – also the feathers have been replaced by the Prince of Wales’s three plumes within a crown. These are backed by two immense scallop shells, textured, fluted and striated. It’s a virtuoso piece of carving, very three-dimensional in character, and attests the skill of the carvers Kent was using. The looking-glass is one of few survivors of Kent’s work for the Prince of Wales, the most notable of which is the Royal Barge; Chapter Twelve is given over to this extraordinary commission. Here, the carver was James Richards, Master Carver to the king in the wake of Grinling Gibbons, working to detailed drawings by Kent. Richards, like Boson, was employed both by Lord Burlington, and by the Prince of Wales at Kew House. His work on the Royal Barge cost more than £150, and the gilding (double gilding and painting), by the Huguenot carver and gilder Paul Petit, almost £260. It – like Boson’s looking-glass – is remarkable for its very plastic, three-dimensional carving. 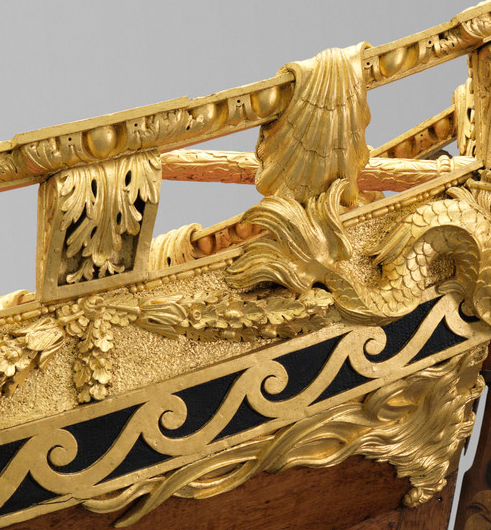 Viewed from above, its motifs and mouldings are constructed upon the form of the hull like an exploded, elliptical picture frame: the rail around the bow is a free-floating egg-&-dart moulding, ending in a tight volute. Similarly, the arched openings to the cabin of the Barge are individually small aedicular picture frames, or en masse a single-tiered altarpiece. The vocabulary employed throughout the boat is impeccably Kentian, with a band of Vitruvian scroll (stylized waves), scallop shells, swags of oak leaves, dolphins and mermaids. The cartouche at the bow of the boat has much in common with Boson’s looking-glass – it is oval, with a crest composed of the Prince of Wales’s feathers and crown against a large scallop shell; the raffle leaves and green man are replaced by mermaids and dolphins. The drawings by Kent make the resemblance to a frame even clearer. Richards’s carving is adept and graceful; from the overall composition to the detail of the small dolphins at the base of the bow sculpture, the mermaids and the swags of oak leaves, the craftsmanship is admirable. Sadly Paul Petit’s work has been regilded, probably several times (for more details on Petit, see the Directory of British picture framemakers on the NPG website ). Petit was himself an extremely skillful carver, executing several elaborate sculptural trophy frames for the Prince, who evidently employed the most skilled craftsmen in Britain to boost the claims of his own court in terms of aesthetics and splendour over that of his father, George II. There are large swathes of this fascinating, vast and meticulously wide-ranging book which cannot be touched on in this review, since the field of Kent’s production was such a broad one. His influence on Palladian picture frames diffuses through many chapters, but will obviously not be found in those on landscape architecture, garden buildings, his royal and other patrons, and his book illustrations. John Harris’s chapter on Kent as ‘Architectural and Ornamental Draftsman’ (Ch. 6), his ‘Town Houses’ by David Watkin (Ch. 7), ‘Public Commissions’, Frank Salmon (Ch. 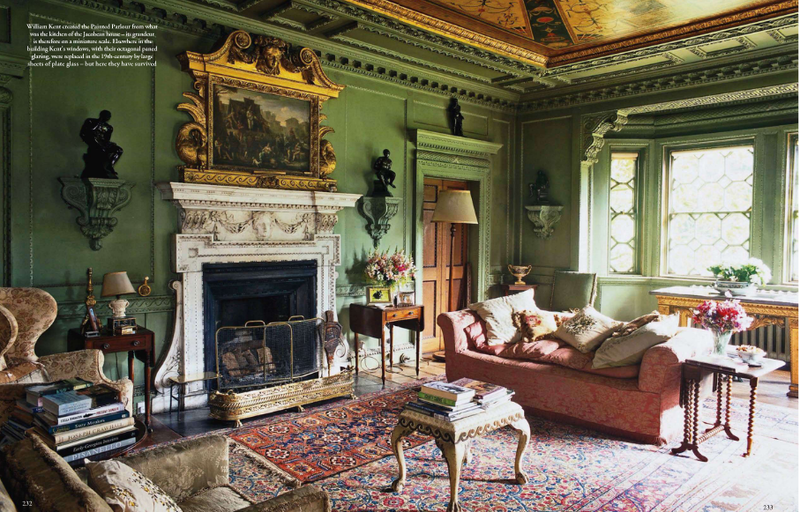 13), and, notably, ‘The Well of Inspiration: Sources for Kent’s Furniture Designs by Susan Weber (Ch.17), touch on the subject via interiors, chimneypieces and engravings (of, for instance, console tables and their matching frames). Susan Weber also notes the influence of Baroque Roman flourishes such as putti and crowning masks on Kent’s work, both of which – especially the masks – are present in his frames, and in the pieces of furniture such as tables which accompany them. Kent’s collection of Italian prints, as well as the furnishings he encountered during his years in Italy, had a profound effect. The same motifs are used even in chandeliers, candlesticks and girandoles (‘Kent’s Metalwork Designs’, by Michael Snodin; Ch. 19), pointing the integrity of Kent’s all-embracing interior designs. The final chapter (21: ‘The Legacy’, by Tim Knox) examines the pool of designs spreading out from the Kentian spring: the work of the men most closely associated with him, such as Henry Flitcroft and Isaac Ware, and John Vardy and Daniel Garrett. The diffusion of Kent’s designs through books of engravings was influential, and continued to be so until it faded into the NeoClassical age, as exemplified by the Adam brothers. 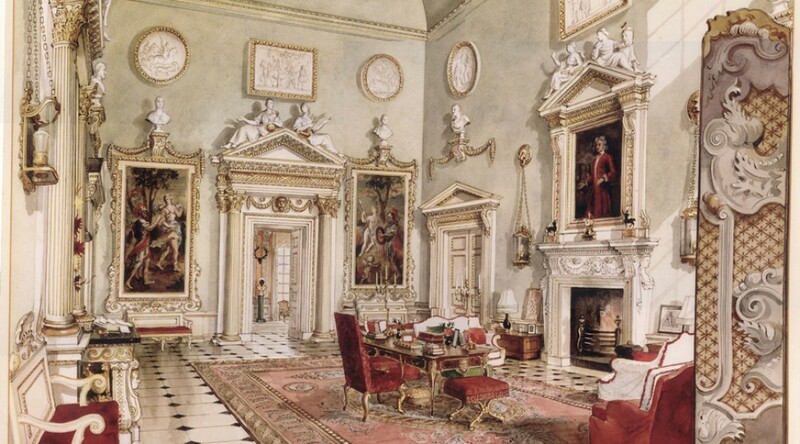 Palladian picture frames were, perhaps, particularly widespread as a style; there are so many of them about, in all their varying degrees of enrichment, from an architrave frame with a single run of ornament to the most luxurious and opulent version of the trophy frame. They marry well with architectural styles in Britain throughout the 17th and 18th centuries (whereas Rococo buildings never really caught on), fitting in with houses in late Renaissance and Baroque style, and later with those in the NeoClassical language of Adam and his school. Apart from the Kentian country houses mentioned specifically in the text, hangings of paintings in ‘Kent’ frames can be seen in the King’s Gallery, Kensington Palace, Room 9 of the National Portrait Gallery, where many of the Kit-cat Club portraits by Sir Godfrey Kneller are hanging in their Palladian frames by Gerrard Howard, the king’s framemaker, and in Tate Britain. 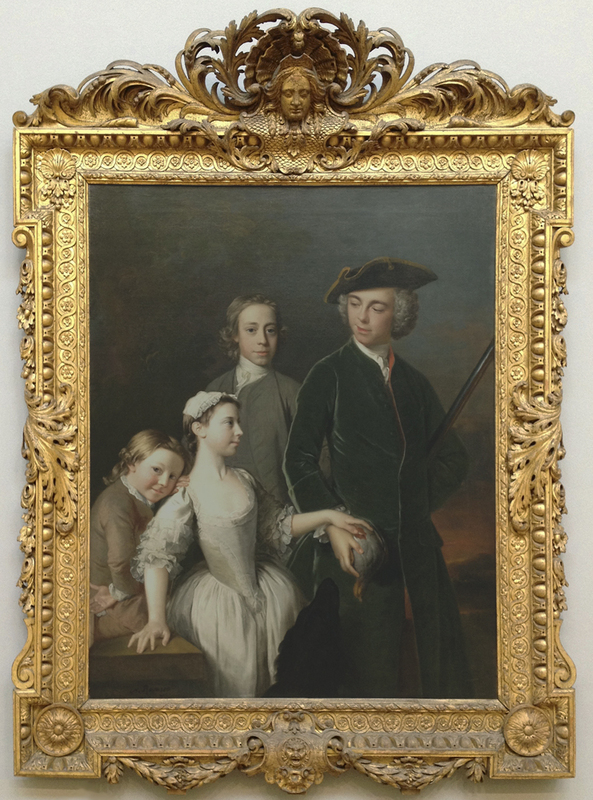 One of the most striking frames in the collection of Tate Britain is this, on Ramsay’s group portrait of Thomas Mansel and his half-siblings. The mansion on the Margam estate in Glamorgan was demolished in 1787, amputating the portrait from its interior, but as a singular statement of the importance and beauty of the ‘Kent’ frame, it can hardly be beaten. Look at all these frames, then, and buy or borrow the book; it’s definitely worthwhile reading for its multifarious approaches to the work of a figure so important in British architecture and design. With grateful thanks to the V & A, and to all those who have kindly provided me with images to use, and/or permission to publish them, especially Charles, 8th Marquess Townshend and Fran Pickering. The craftsmanship and artistry of the frames often eclipses the paintings. 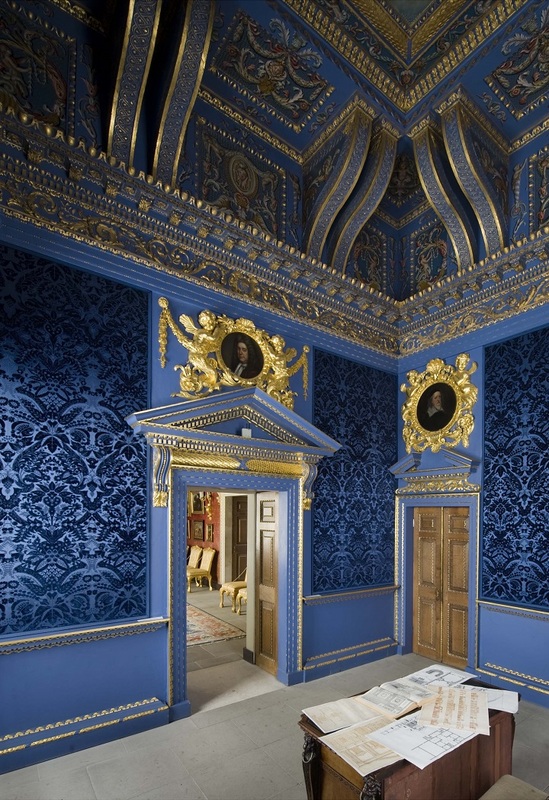 I hadn’t seen the blue velvet room at Chiswick Hall; gorgeous color against the gold. It blows me away when I think of how much time and skill is involved in the carving; clearly a labour of love. Wonderful, indeed, Lynn. Great review. Thanks a million for this one. I’m getting behind with book orders and here’s another I’m adding to my soon-to-get list. WOOHOO! Thank you, Barrie – I’m so glad that you enjoyed it! The book is definitely worth getting: the illustrations and production are terrific, and it covers so many different aspects of Kent.